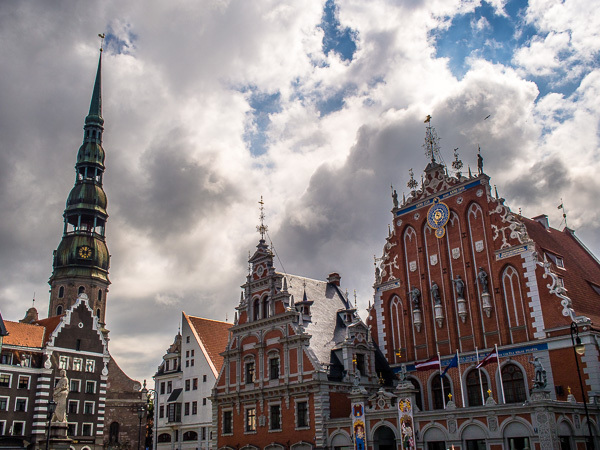 In this Riga guide, we will be letting you in on the secrets of how to have an amazing 48 hours in this vibrant hipster city. The guide is broken you into a chronological list of things to do, bars to drink at, cafes/restaurants to eat at, and tourist attractions to visit. On our way down from Tallinn, I was trying to imagine the Riga that my Latvian grandma had told me about. In her stories, everyone wore traditional clothes, danced funny, listened to folk music, only ate peasant food and everything was grey and sad. It turns out, though, surprise-surprise, things have changed and Latvia is now the heart of the Baltics. Since coming out from Soviet power in 1990, Latvia’s capital Riga has blossomed into a hotbed for fashion models, super fast internet, hip cafes and urban gentrification projects filled with stylish young, innovative people. 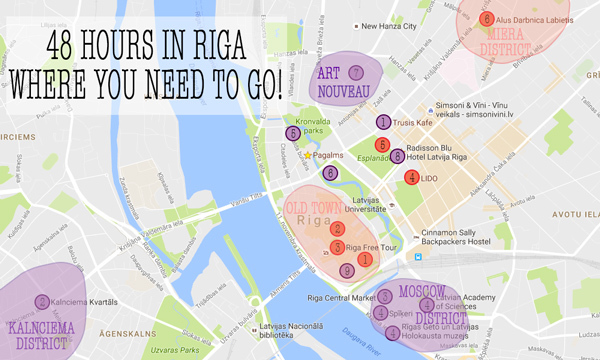 All of which is now making Riga an exciting place to live or visit. 1. Try Some Local Food, Eat Some Piragis! 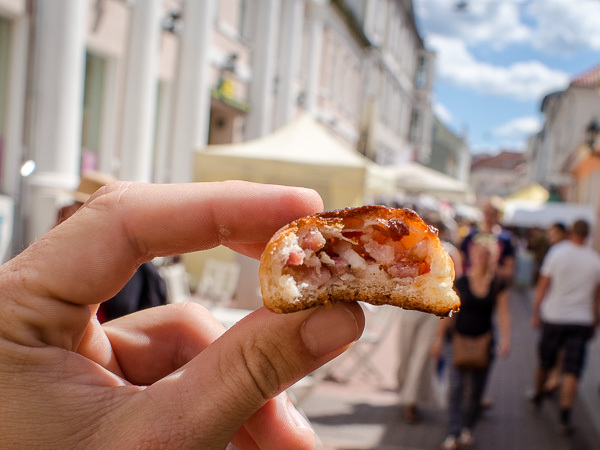 Start your adventure in any one of the Martina Bakerija bakeries and grab a coffee and a heap of Latvia’s best traditional food, piragis, to prepare yourself for a big day of walking! Once you’ve got those legs pumping towards the old town, start wandering the streets checking out some of the sights. Now it’s time to head back to school and learn a bit more about what you’ve been looking at, so jump on a free tour from St. Peter’s Church at 11 am. After learning all those fun facts and burning all those calories you’ll be a little hungry. A great option for lunch is the Lido buffet. Lots of traditional Latvian options to choose from, but just watch out for how much you choose as it can add up quickly if you’re not careful. Once you’ve finished stuffing your face with sauerkraut and pork, head to the Occupation Museum. A look into the sordid past of Latvia through occupation from Russia, Germany, independence, Soviets, Nazis and finally the Soviets yet again. They have really had a rough time over the last 100 years and the museum does a great job of not boring you to death with information. Entrance to the museum is free, but there is a donation box on the way out if you want to help them out. Enough of Latvia’s past and time to see what Latvia is up to nowadays. Jump on a tram and wander the youthful streets of the Miera district. See lots of street art, good cafes, boutique shops and bars. The centre of it all is an old abandoned brewery, but now it’s one of the best party spots in town. There are several bars, clubs and restaurants with Labietis Brewery the pick of the bunch. The great local beer that is brewed on site (you can see them working while you sit at the bar) and tastes delicious. My favourite for the night was the wonderfully dark and potent ‘Tapeworm Slayer’. 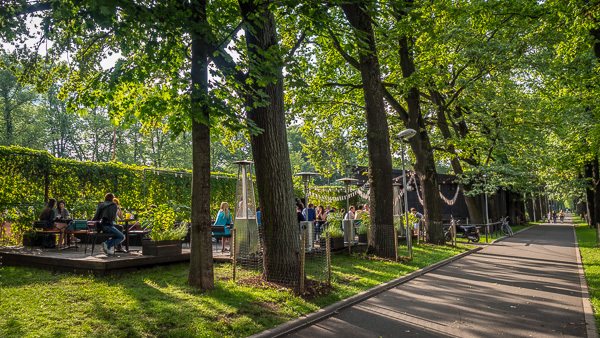 Start your day at the trendy Trusis Kafe for a good coffee and bite to eat before heading to Riga bike rentals for your new wheels. Once you’ve got your bike go straight across the river and roll through tree-lined streets checking out Riga’s old Soviet era wooden architecture in the Kalnciema Quarter. This great area of Riga isn’t overly hipster and has a nice young vibe to it. 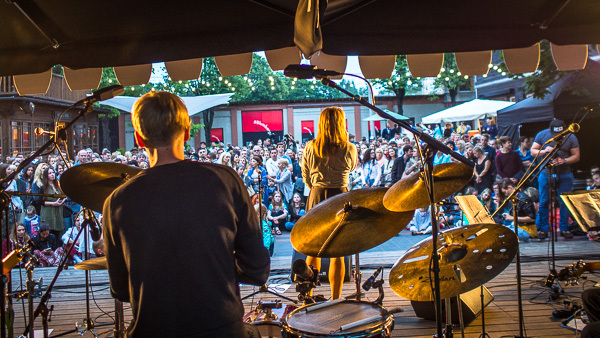 They also have a market on Saturdays and open air concerts on Thursdays during summer. If you’re around it’s a definite must-see and you can check out what’s on and the times here. Once you’ve had enough of looking at houses, cross back over to the touristy side of Riga via Akmens Bridge and head to the Central Market. 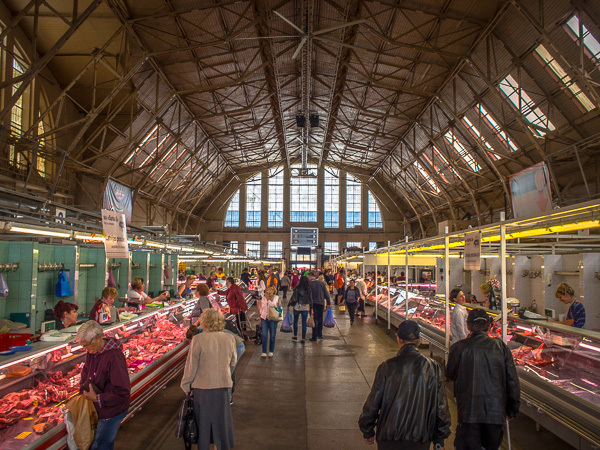 Inside Europe’s biggest market you’ll be amazed by all the fresh produce and traditional goodies up for grabs. If you want to buy some food, a good bet is to aim for the foods that the locals are going for. Anything pickled, smoked meat and fish, cheese, berries, herring, piragi (bacon and onion rolls) and the “famous” Latvian black (rye) bread. 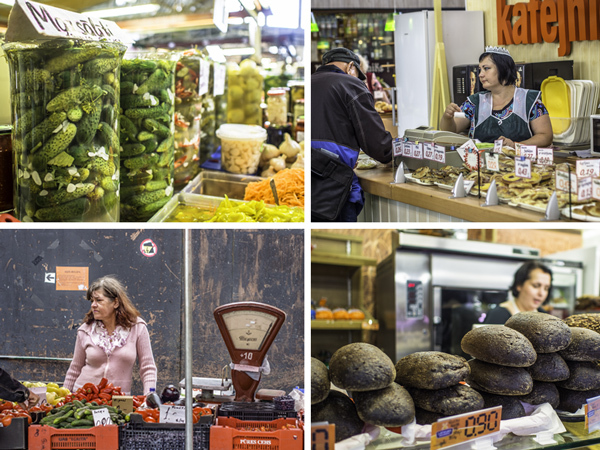 Once you’ve finished wandering the markets don’t eat your food and save it for a picnic! 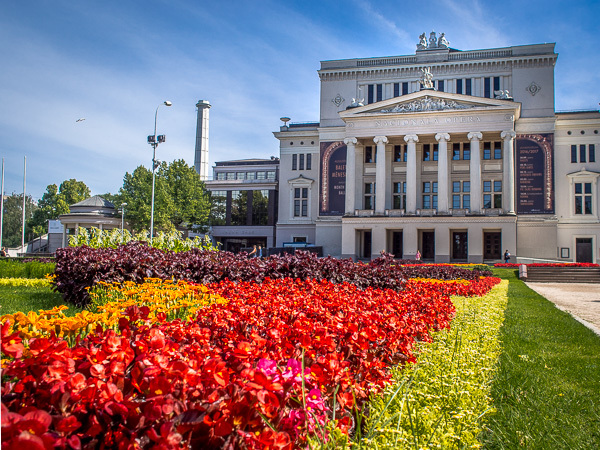 First, though, go for a quick ride through the creative district of Spīķeri, have a look at Rīgas Ghetto Holocaust museum and the biggest reminder of Riga’s Soviet past, the Academy of Science building in the Moscow district. 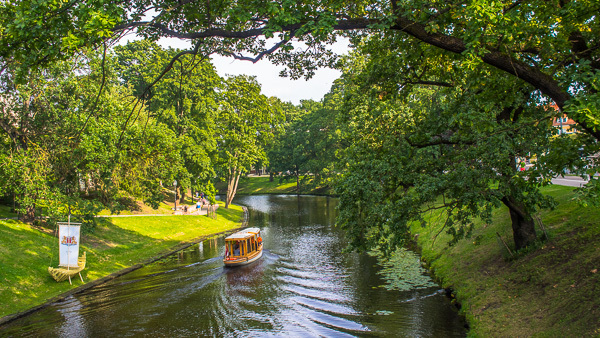 Now if you’ve had enough of Riga’s dark past cheer yourself up with a ride back through Old Town or along the canal to the quieter Kronvalda Park to unpack your picnic. If you couldn’t wait and you ate your picnic food hours ago Palgams is a good option for lunch. The food is super tasty, they have a great selection of local beers and your surroundings are pretty dope. If you’re an outdoorsy person who wants a bit of upper-body exercise, go for a kayak through the city canals. There is also a night kayak tour if seeing the city by starlight seems more up your alley. Or if you’ve had enough exercise and museums are more your thing, head to the newly renovated Latvian Museum of Art. 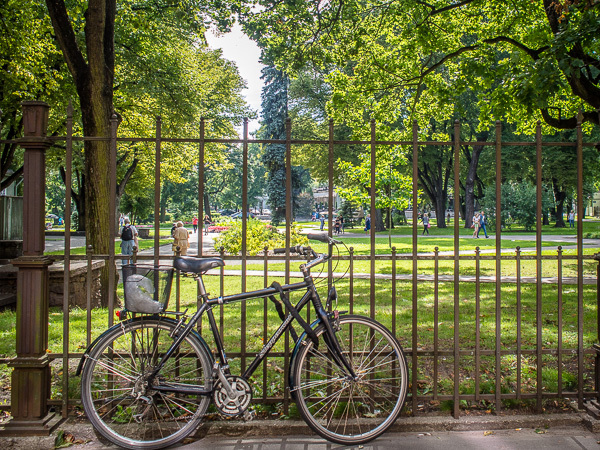 Time to lock up your bike and walk around Riga’s Art Nouveau district. You’ll be able to see some fancy old-school looking buildings. 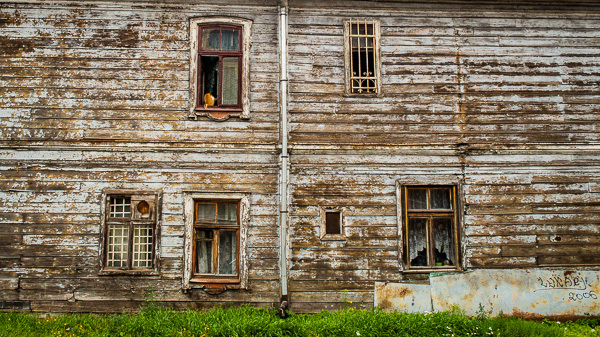 It’s the most up-market area of Riga and a nice place to see how the other half live. 8. Free View Of Riga! While you’re in the area head to the top floor of the Radisson for a great FREE view of the city. If you want a drink with the view, though, head next door to the lower, but cheaper rooftop bars. Make sure you check out the view from the toilets before you leave the Radisson! Not a bad view while you sit on the toilet…. Return your bike and top off your 48 hours with some local beers and a traditional, cheap and HUGE meal from the best restaurant in Old Town, Folkklubs Ala. There is the added bonus of possibly seeing folk music and dancing while you enjoy your meal and final moments in Riga. 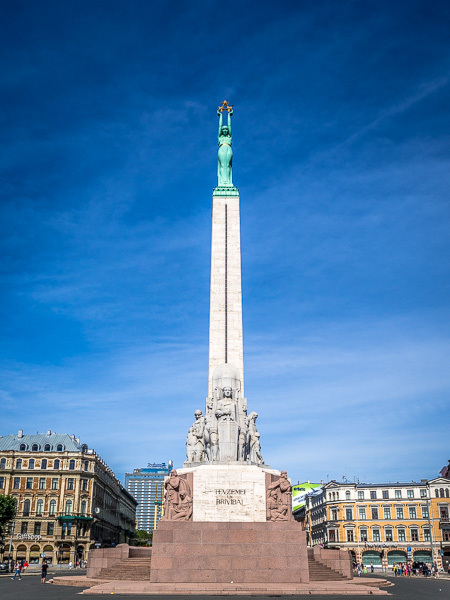 Riga has an international airport and is a hub for the Baltics. Air Baltic usually have the best deals in the area, but check Skyscanner just in case. Superbus and Simple Express have some greats deals for buses throughout the Baltics and even onto Russia. Everything listed is easily walkable apart from the Kalnciema Quarter and Miera district. For those, there are trams and busses everywhere or you can rent a bike with Riga bike rentals. Do yourself a favour, though, and buy tickets from machines or shops before getting on board. If you buy from the driver it’s €2 instead of €1! Cinnamon Sally Backpackers Hostel in Riga: Latvian-Aussie couple relaxed and chilled vibe. Riga Old Town Hostel & Backpackers Pub: Connected with the Aussie pub which is one of the best bars in old town.